Hi there, my darlings! So, as ColorSutraa continues to grow, I'm astonished and incredibly grateful for the fact that I have readers all over the globe--from Europe to Asia! I can't even begin to tell you how much it means to me that so many people are checking out the blog--I do hope you are finding it informative and fun! So, in an effort to cater to my global readers, I try to keep ColorSutraa international, not only with our giveaways but also with some of the products I choose to feature. Today, it's all about Israeli skincare brand, Queen Odelia--I'll be sharing my thoughts on 4 products from the brand, two for the face and two for the body. Description : The Queen Odelia facial serum’s highly concentrated active ingredients target the deep-set causes of premature aging. It provides the skin with important nutrients and lubrication that will give your skin a naturally youthful quality. Benefits : The serum feels luxurious, glides over the skin, and smells amazing. It will invigorate your skin, and your skin will appear noticeably smoother even after the first time you apply it. Suggested Use : Our dermatologists strongly recommend the combined use of both the Queen Odelia moisturizer and the Facial Serum. 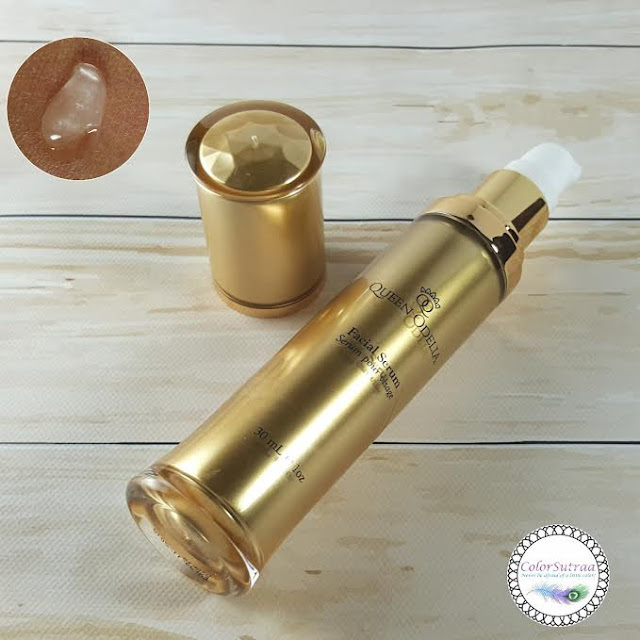 They claim that merely applying the serum is not enough to strengthen the skin. Adding your favorite moisturizing day cream to your daily beauty-care routine can really improve the serum’s performance and do wonders for your skin. IMPRESSIONS : I have to admit that I've pretty much stayed away from adding a serum to my skincare routine. I've reviewed several and liked quite a few but I'm always nervous about breakouts. Oh and I usually spend the most time on my skin at night and for me, there's nothing worse than a sticky face just before bed! I tend to get really hot while I sleep so any product that adds to my discomfort is a definite no-no! This, however, I really like! Beautifully scented and light as air, this serum left my skin feeling tauter , smoother and plumper without the uncomfortable stickiness. Big thumbs up from me! Benefits : Queen Odelia’s light cream smooths out fine wrinkles and crows’ feet, as well as provides the skin with rich, oily nutrients. Night time application of this cream restores elasticity and tightens your pores during the course of the night. Suggested Use : Because new skin cells grow faster while you sleep, the most effective way to keep your skin in its prime is by applying cream around your eyes and moth at night. Applying this all-natural cream before you go to sleep gives your body all the time it needs to prep, prime, and repair your skin. The cream will have you looking fresh and bright in the morning while you get your beauty sleep. IMPRESSIONS : Since I have sensitive skin which is prone to random, annoying breakouts, I can be really picky when it comes to what I use on my face--I tend to stick to the tried and true, i.e., my Oil Of Olay. But I liked this one--A LOT. Combined with the Facial Serum, it left my skin feeling really hydrated and moisturized without feeling greasy or sticky! This, too, has a beautiful, floral scent which I absolutely adored! 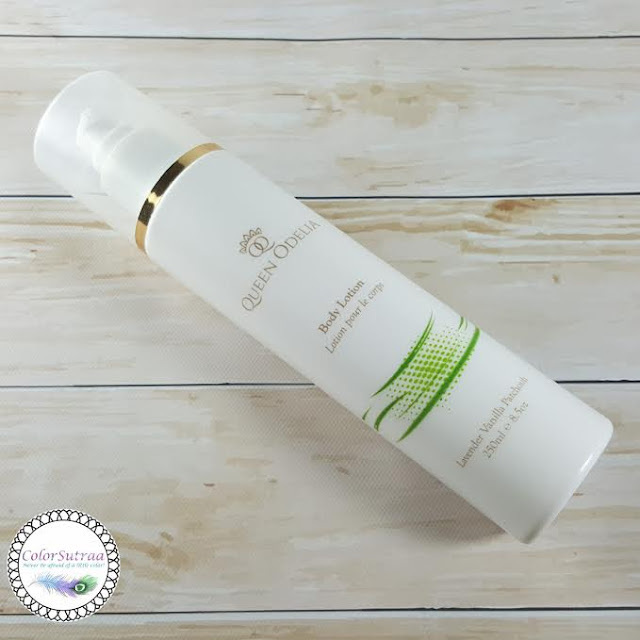 Description : The Queen Odelia body lotion is based on a formula rich in antioxidants that uses a unique blend of vitamin E, Prickly Pear Seed Oil, and natural extracts. This aromatic blend brings all the most important components together to moisturize and soothe the skin, leaving it feeling velvety and soft. You will love this smooth and refreshing lotion for its amazing, fruity smell and extravagant feel. Benefits : The body lotion ensures that the entire surface of the skin is always kept soft to the touch and smelling extraordinarily sweet.One of the best things about the lotion is that it does not require a lot of product to make a good lather. Even the packaging of this item was carefully thought out. The bottle is equipped with a special pump secured in a way that allows only for precise, effective discharges of product. In this way, the measured doses of cream are easily absorbed into the skin and not smeared in a way that is inefficient and wasteful. Suggested Use :The body lotion is most effective when used on a clean expanse of skin anywhere on your body. The lotion is best applied using slow, circular motions on the designated body part, and will have a lasting effect all day long. Disclaimer: The lotion may be used on the face, but it does not possess the specific and very delicate ingredients that the facial serums and moisturizers do. IMPRESSIONS : This lotion feels like a high-quality product and I really love the formula. Super fast-absorbing, this is the true definition of a lotion, in my mind--rich and luxurious without being too thick or heavy. It left my skin soft, smooth and supple for hours, even on the coldest of days. What I didn't like? The scent. The Lavender Vanilla Patchouli did not agree with me at all. While it may smell powdery to some, I found it quite offensive to my senses. Not something I would reach for over and over again. 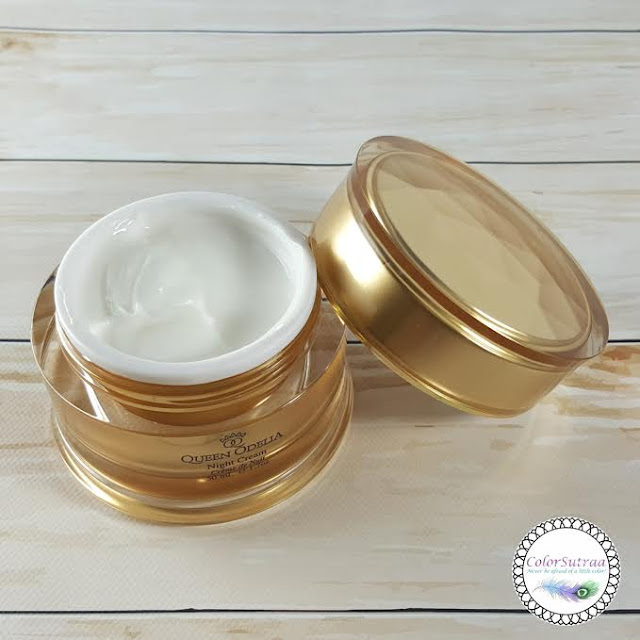 Description :If you’ve ever had to think twice before kicking off your heels and relaxing at the nail salon, if trying on a new pair of fling-backs has ever made you uncomfortable then Queen Odelia’s Nourishing Foot Cream is just what you’ve been looking for. Benefits : Different parts of the body are directly linked to alternate points on the bottoms of our feet. Therefore, different ailments can be relieved and avoided by taking proper care of your feet. Suggested Use : To get rid of those aching dead skin build-ups, lather your feet with this soothing salve and see the amazing results – no exfoliating necessary! 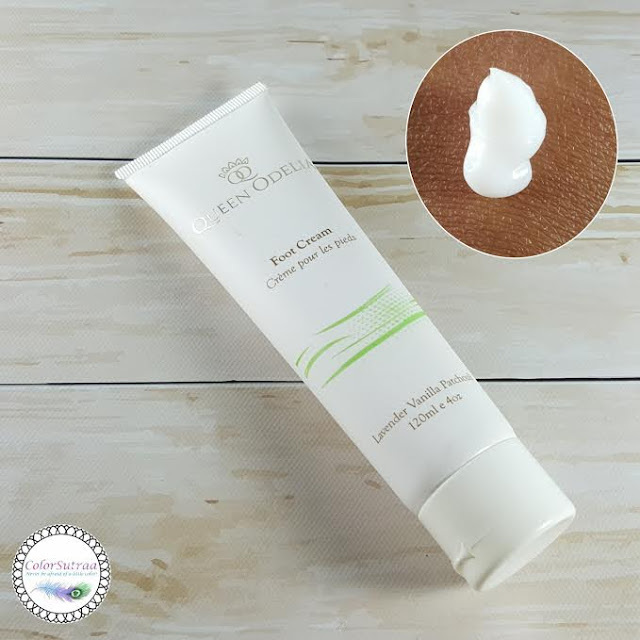 Queen Odelia’s luxury foot cream will protect your skin from further dryness and provide you with the comfort you need to keep you on your feet. IMPRESSIONS : Ah, feet! Such a touchy topic for me nowadays. During the winters, my feet are my true trouble area, cracking and peeling badly. They really do tend to look like I've been playing soccer, barefoot, in a coal mine! Sigh. So, foot creams are staples for me in the colder months. This one is a lighter formula than I usually like but much like the body lotion, absorbed very well. If you're one of those people who don't like lotion on your feet, try this one! It absorbs so quickly that you won't have an issue for very long. The cons? That same Lavender Vanilla Patchouli scent. Really not for me! 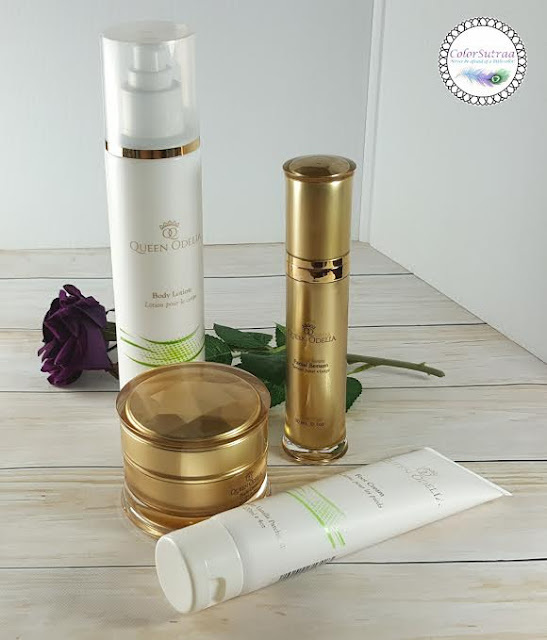 You can find all of Queen Odelia's products on their website HERE--prices are in the luxury skincare range! But wait, let me make things sweeter for you! Use my code : COLORSUTRAA for 20% off the entire site + free shipping on $50 (after discount). Valid till February 29th so grab your favorites! These products look really nice! I've been hearing such good things about this brand. I'm glad you're enjoying them. The packaging is so luxe! Serums are my favorite skincare item after eye creams. I use one daily. I like Lavender but not Vanilla and Patchouli... especially the Patchouli. Hopefully there's a fragrance free in the future! I love Queen Odelia day cream! This is a new brand for me, but it sounds great. The serum is especially appealing. I haven't heard of Queen Odelia products before. Thanks for the review!